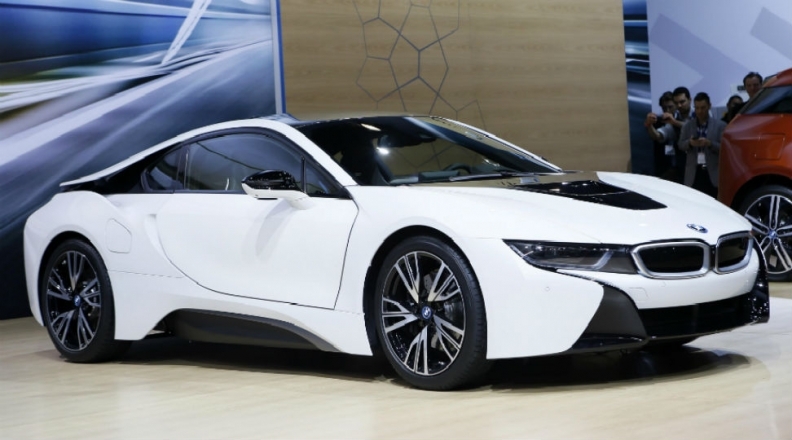 BMW says it has improved performance and fuel efficiency of the i8. FRANKFURT (Reuters) -- BMW said there is strong demand for its i8 plug-in hybrid supercar which will begin rolling out to customers in June. "Demand for the BMW i8 is already exceeding the planned production volume during ramp-up," BMW said in a statement on Monday, without giving a more specific figure for how many cars will be made during this phase. To give the carbon fiber car an operating range of up to 600 km (373 miles), the 362-horsepower i8 is powered by a hybrid system. This combines a 96 kilowatt electric motor driving the front wheels, and a turbocharged 231-hp three-cylinder gasoline engine. Green cars, and electric vehicles in particular remain a niche product, because their limited vehicle range limits their use when compared with gasoline or diesel-powered cars. Munich. With the completion of the development work and final preparations for production at the BMW Group plant in Leipzig, the launch of the BMW i8 approaches its peak. Delivery of the first customer cars will start in June 2014, beginning with the main European markets.